In 1991, Sara Evans moved from her family farm near New Franklin, Missouri, to Nashville, Tennessee, to become a country music artist. It wasn’t long before she was signed by RCA Nashville. Over the years, she has sold about six million records, and her last four albums have been certified Gold, Platinum or multi-Platinum. Evans has scored several No. 1 hits, among them “Suds in the Bucket,” “A Real Fine Place to Start,” “No Place That Far” and “A Little Bit Stronger,” the title track of her chart-topping 2011 album Stronger. The talented singer/songwriter performed at the 2006 ACM awards show in Las Vegas where she won Top Female Vocalist, and she hosted the 41st annual CMA Awards show with LeAnn Rimes on November 7, 2007. The artist sang “A Little Bit Stronger” on the finale of season 12 of the ABC TV show Dancing with the Stars where she was the first country artist to ever compete on the program. In addition to her music, Evans has written three books with co-author Rachel Hauck and writes a lifestyle blog with her sister-in-law Kaelin Evans. On August 15, 2013, Evans announced a new single called “Slow Me Down,” and she debuted the album also titled Slow Me Down during a concert in her hometown of Birmingham, Alabama, a few days before the record was released on March 11, 2014. Evans is married to Jay Barker, a former University of Alabama quarterback, national championship winner and current radio show host. She and her three children live in Mountain Brook, Alabama, a suburb of Birmingham, with Barker and his four children. Melissa Parker (Smashing Interviews Magazine): Sara, the new music is great! I can’t get the song “Slow Me Down” out of my head. Did you have an idea about the album before you chose the songs? Once we found that song, I just fell in love with it and made it the centerpiece of the album sort of like if you bought a painting and decided that everything else in the room has to work with that painting. I do that a lot. I did that with Born to Fly and Stronger. I’ll have one song that influences everything. But with me, it’s just mostly praying and hoping that the songs are out there. There are so many songs that have been written, and you never know what’s out there because sometimes the publisher may not think about Sara Evans for that particular song. It’s a really fun game sort of like finding the best. Melissa Parker (Smashing Interviews Magazine): Why did you choose to record “Not Over You,” the Gavin DeGraw hit? Sara Evans: I just loved it. I’m a huge fan of his voice. I like to put cover tunes on every record, so that was one that I chose, and then we thought, “We should ask him to come sing harmony.” What he did on it was just phenomenal! I cried when I heard it. I wasn’t able to be in the studio with him the day that he came. Gosh. It’s almost like he put more into my version than his. Melissa Parker (Smashing Interviews Magazine): I do love your version. Sara Evans: I do, too. It’s because of him (laughs). Melissa Parker (Smashing Interviews Magazine): You wrote three songs on the album: “You Never Know,” “Sweet Spot,” and “If I Run.” Did you draw from personal experiences? Melissa Parker (Smashing Interviews Magazine): That’s pretty catchy though. Sara Evans: Exactly. I should write that down (laughs). Melissa Parker (Smashing Interviews Magazine): It’s more just subconsciously. I may have something happen with an extended family member in Missouri that brings out an emotion in me that causes me to write what I write. I really did write “Sweet Spot” about Jay and me and our life together. Melissa Parker (Smashing Interviews Magazine): What about “You Never Know” and “If I Run”? Sara Evans: “You Never Know” wasn’t written about my life specifically but just about how life can be so unpredictable … especially love. You never know when someone can change how they feel about you in the blink of an eye. “If I Run” was written about how women just want to be pursued and chased after. We want the men in our lives to fight for us, to show us that they really care. Melissa Parker (Smashing Interviews Magazine): Were there obstacles you had to overcome as a woman trying to break into the country music business? Sara Evans: I had none. When I came onto the scene, country music was heavily dominated by women. There was Martina McBride, Patty Loveless, Faith Hill, Reba McEntire, Trisha Yearwood, the Dixie Chicks, Lee Ann Womack, LeAnn Rimes, Dolly Parton, Wynonna Judd. Women were everywhere. Melissa Parker (Smashing Interviews Magazine): Is there a double standard in the music business for men and women concerning physical appearance? Sara Evans: I wouldn’t call it a double standard, but just how it is. Women like to do their hair and makeup and pick out pretty clothes and shoes. So for us, it definitely takes more time and effort to get ready than it does for guys who can typically throw a baseball cap and some jeans on and be ready to walk on stage. Sara Evans: Well, my brother Matt rides the band bus, but his wife Kaelin “KK” rides with me along with their one-year-old daughter Milly. My kids grew up on the road and learned to walk on the bus, so it’s fun to have that experience again with my niece who is so precious. No matter what is going on, she puts the biggest smile on my face when I get on that bus! Melissa Parker (Smashing Interviews Magazine): Sara, what prompted the move from Nashville, and do you miss living in the Music City? Sara Evans: When I married Jay, I wanted to immerse myself in his life and in his kids’ lives and truly blend our families into one. Jay’s radio show is based here in Birmingham and his kids lived here, so it made more sense for me to move to Alabama. I’ve truly fallen in love with the state and with Birmingham. I do miss Nashville, which seems to be the “it” city right now! It makes scheduling my career a little more challenging, but my team is great at working with me, and we maximize the days that I go up to Nashville. Melissa Parker (Smashing Interviews Magazine): How do you and Jay juggle domestic duties since you both stay so busy with careers? Sara Evans: I couldn’t ask for a better husband and support system. Jay is truly amazing. I’m a firm believer in cooking for your family as much as you can, and I don’t like fast food or eating out that often. So I definitely like to cook big home cooked meals for the family. I do have someone who comes in and helps with the laundry and cleaning up the house a few times a week, but I’m definitely the one in the kitchen cooking. Now that the kids are getting older, I’m going to have them start pitching in with the laundry and learning to be self sufficient as much as possible. I also love teaching them how to cook. Also it takes a lot of scheduling, a lot of preparation. I can’t do all that the male artists do that don’t have family obligations and can’t be gone for days and days away from my children. I won’t do that. I refuse to do that. My strategy is to make the very best music I can possibly make and then hope that it stands on its own. Melissa Parker (Smashing Interviews Magazine): When you and Jay have that rare time to yourself, what you do enjoy? Sara Evans: We enjoy having a glass of wine and just sitting on the porch talking and catching up about our days and what’s going on with the kids. Jay is my best friend, and who wouldn’t want to just sit and talk with their best friend at the end of each day? Melissa Parker (Smashing Interviews Magazine): It’s interesting that you have seven kids now, and you are also one of seven children. Did your parents support your aspirations of becoming a country music artist even while singing in a nightclub at age 16? Sara Evans: (laughs) Yes, my parents were the ones that really started our family band and encouraged my siblings and me to immerse ourselves in music. I’ve been onstage since I was a little girl, much younger than 16, so this is what’s always come naturally to me. Eventually the family band became the “Sara Evans Show,” and I took over lead singing duties, and it was centered around me. Melissa Parker (Smashing Interviews Magazine): Is there a country newcomer out there that you believe will become successful in the genre? Sara Evans: There are so many talented newcomers out now! I love David Nail’s voice and song choices … and he’s a fellow Missourian, which always helps (laughs). Melissa Parker (Smashing Interviews Magazine): Have you already worked on the Doobie Brothers new album? I understand that Michael McDonald returned to perform on the record. Sara Evans: Yes. I went in and recorded my part on a song that I can’t tell you about yet. I’m sworn to secrecy until they release the track listing. I am so honored to be included on the project though and have been a fan of the Doobie Brothers and Michael McDonald since I was a little girl. My dad had all of their records, and we had them playing in the house all the time. Melissa Parker (Smashing Interviews Magazine): Have you ever thought about branching out into acting? Sara Evans: I’d absolutely love to get into acting, and we’re currently looking at some potential opportunities. I’ve been approached before, but typically they shoot in LA or on location for extended periods of time. With my kids and my touring schedule, it would have to be in the summer. But yes, it’s definitely something I’m into. Melissa Parker (Smashing Interviews Magazine): Would you ever think of returning to Dancing with the Stars? Sara Evans: I would love to return to Dancing with the Stars, but again, it just depends on the filming schedule. When I was on it the first time, my kids were younger, and it was easier to relocate to LA for the season. Now that they’re older and into more sports and activities, it would make it a challenge. If they did the show during the summer, I’d definitely be game! Melissa Parker (Smashing Interviews Magazine): I know that Rock the South began on the one-year anniversary of April 2, 2011, the day the South was “rocked” by an historic tornado outbreak, and now it’s a yearly event in Cullman, Alabama. 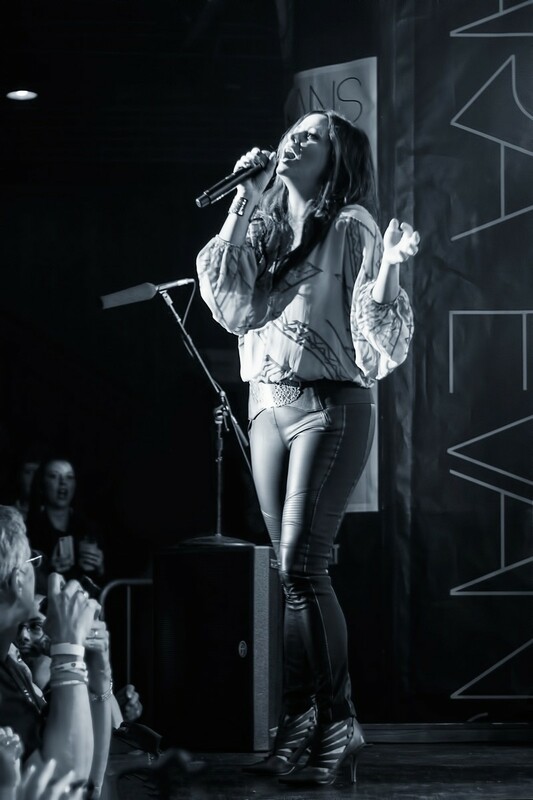 Sara Evans: Yes it is, and it’s been amazing for me to watch what Jay has built with Rock the South along with his business partner Shane Quick. The crowd blew me away last year, and I can’t wait for this year’s festival on June 20-21. We have an amazing lineup, and I know the fans are going to have a blast! Melissa Parker (Smashing Interviews Magazine): What are the charities you support? Sara Evans: I’ve been involved with several charities throughout my career but lately have been helping St. Jude Children’s Hospital as much as I can. I was able to visit the hospital in Memphis a few months ago, and it really hit home with me. I had been before when I was a new artist, but this time now that I have kids of my own, it really made an impact. I’d strongly encourage everyone reading this to become a Partner in Hope. I’ve also been a longtime supporter of the American Red Cross. They provide to many great services and relief, which I’ve witnessed firsthand. Jay and I are also on the board of Alabama Forever, which was started to provide relief to families hit hard by the tornadoes in Tuscaloosa a few years ago. It has now transitioned into helping families in need throughout the state of Alabama. Melissa Parker (Smashing Interviews Magazine): Thanks for all that you do, Sara. Other than promoting Slow Me Down, any upcoming projects? Sara Evans: Kaelin and I are constantly working on growing the blog (arealfineplace.com), and I’m having such a great time learning how to blog and honing my writing chops. The fan response has been phenomenal! I’m also about to launch a new program with Hidden Valley Ranch called Crunch Time that encourages healthy eating with kids from the time they get home from school until the time they go to bed. It should launch in April, and I’m really excited about the program and the message it’s sending. Sara im 13 and i live in Sylacauaga alabama and i would like to meat u ! !